A simple online subscription solution is helping governments meet the challenges associated with the redistricting process. 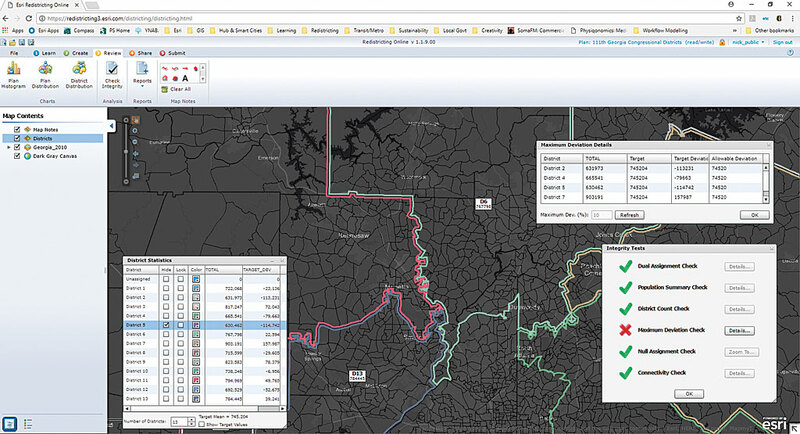 Balance various redistricting requirements and immediately see the effect of changes on plan goals using Esri Redistricting Online. Every decade, the lines that determine congressional, state legislature, and local government districts in the United States are redrawn based on decennial census data. Although historically the process has been opaque, often politically charged, and largely ignored by the public, it is a vitally important process because it tremendously affects who can and will be elected to represent citizens on the local, state, and federal levels. Every year, the geographic distribution of people changes. People are born, retire, die, or relocate. When that happens, it often necessitates redrawing districts to accommodate these changes. The redistricting process is made more challenging because governments must balance competing considerations when redrawing boundary lines each decade. Comprehensively view the status of the statistics associated with each district in a plan. Congressional and state legislature districts must have equal population to comply with the US Supreme Court “one man, one vote” rulings. To comply with the Voting Rights Act of 1965, districts should reflect race and ethnic diversity. States and local governments can add other constraints such as contiguity and compactness relating to district shape, respect for political boundaries, geographic features, communities of interest, and political fairness. Because the process is based on who lives where, it is an intrinsically geographic one that requires the integration of many factors, which can be addressed most effectively with GIS. It’s no surprise that GIS was applied to redistricting activities as soon as it became commercially available in the 1980s. GIS-based redistricting solutions have been evolving since that time. The Esri Redistricting Online solution is a software-as-a-service (SaaS) subscription. This application now gives state and local governments, the public, and advocacy groups unprecedented access to the redistricting process. This capability can provide complete government transparency. Interactive Web GIS is the perfect technology for drafting redistricting maps because the effects of boundary changes on associated populations can be tested interactively and worked on collaboratively. Esri provides reliable current-year estimates and five-year projected population figures, so governments don’t have to wait until the US Census Bureau delivers demographic data to states in 2021. Use Esri data to better understand the trends and factors at work in a region, assess redistricting scenarios, and build consensus. Once district boundaries are finalized, the demographic data used for this process remains valuable and can be used to improve election management. This online solution promotes transparency and engagement by allowing proposed redistricting scenarios to be shared online with others in government, constituents, and the media using a system of secure access. To learn more about Esri Redistricting Online and obtain an evaluation subscription, visit ArcGIS Marketplace and search for redistricting.